With Avengers: Infinity War proving to be such a monumentally important installment in the unfolding Marvel Cinematic Universe, fans keep picking up moments from past films that could be construed as foreshadowing the recent movie’s climactic events. For instance, scenes such as Tony Stark’s nightmare in Age of Ultron or the ominous animation used for Black Panther‘s credits sequence have taken on new meaning in light of Avengers 3. Now, we can add another scene to the ever-growing list. 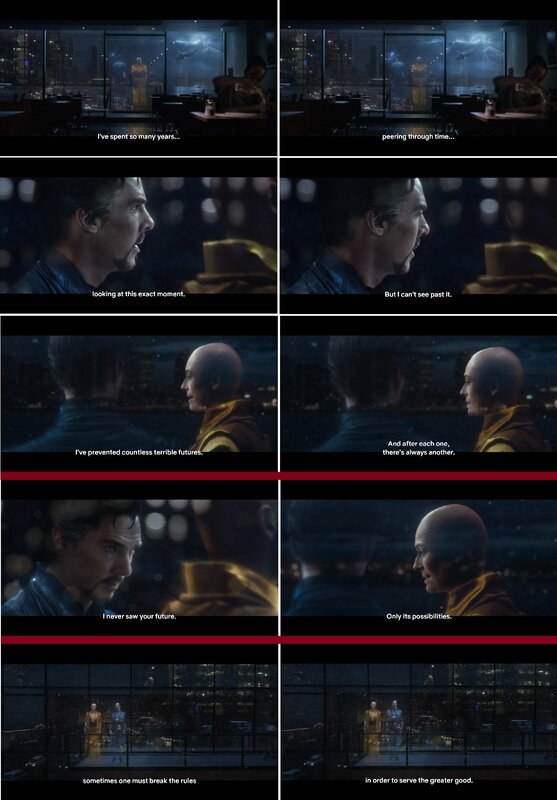 One fan re-watched 2016’s Doctor Strange recently and noticed that the Ancient One’s last words to her protege, the titular Stephen Strange, could be interpreted as a warning of what would come to pass when Thanos came a-knocking. As The Ancient One makes clear, she can’t see beyond that point in time, so she doesn’t predict Infinity War, but her parting message to Strange that “sometimes one must break the rules in order to serve the greater good” could be said to reflect his actions in the future movie when he decides he has to give Thanos the Time Stone. After all, it’s a common fan theory that the Sorcerer Supreme knows exactly what he’s doing here and, in the long run, he believes that things will work out all right. The reason he knows this is because he used the Time Stone to view millions of alternate futures earlier in Infinity War and only found one where the Avengers came out on top. Perhaps the reason The Ancient One could only see possibilities in Strange’s future, then, is because the timeline was about to come to a delicate moment where it could go down many paths, those that the hero foresaw on Titan. At the very least, we’d like to think that Strange remembered what his mentor said to him while on the aforementioned planet in Avengers: Infinity War and decided to do something drastic in order to – eventually – save the universe.